Dates are the perfect food for our health. They are excellent for boosting teart health, preventing hypertension, stroke, or high cholesterol. Plus, they are rich in nutrients that are excellent for improving the metabolism (1). Furthermore, there are plenty of reasons why you should eat these fruits. Dates contain plenty of minerals and vitamins. They are a great source of energy, magnesium, zinc, phosphorus, selenium, and potassium. They include elemental fluorine which helps protect against tooth decay. On the other hand, they contain selenium which helps boost the immune system and prevent cancer (2). Researchers investigated the glycemic index of 5 varieties of dates: Bo ma’an, Fara’d, Dabbas, Lulu, and Khalas. They discovered that all of these varieties have a low glycemic index, and that eating them won’t cause a significant blood sugar spike. That’s why they suggest that dates can be included in a healthy balanced diet for people with diabetes (3). Dates contain plenty of potassium, which makes them perfect for keeping the nervous system healthy. Furthermore, they might even prevent strokes. To get these benefits, consume 400mg of potassium each day to boost the cardiovascular health (4). Therefore, eating only 5 to 6 dates can provide the necessary amount of magnesium (80mg) and other minerals. Besides, we need magnesium to boost the blood flow and keep the blood pressure in check (5). One study suggests that consuming 1/2 a glass of pomegranate juice along with three dates (preferably with grounded pits) reduces the risk of cardiovascular disease (6). As we mentioned before, dates can keep the blood pressure in check. But, they can also help people with diabetes manage their cholesterol. Furthermore, they can help get rid of the bad, also known as LDL, cholesterol from the blood (7). This is a crucial step in managing diabetes. Therefore, people who have to face this condition on a daily basis should consume dates. But, have in mind that dates contain plenty of natural sugars. So, be careful not to consume an excessive amount. Dates are a great source of potassium and soluble fiber – nutrients which can help treat constipation. That’s why they can help regulate your bowel movements (8). Eating dates might reduce the chance of developing colon cancer (9). Plus, they are a remedy perfect for all ages. Since they are a natural remedy, they do not have any bad side effects. Therefore, we highly recommend dates for boosting the abdominal health. 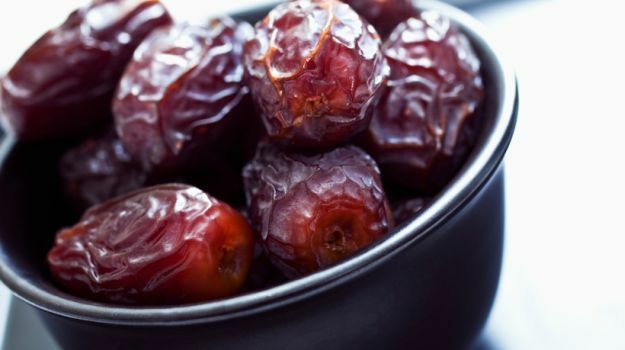 A study found that dates can help control diabetes and cancer, as well as postpone their progression. These effects are thanks to their great antioxidant, anti-inflammatory, and anti-tumor properties. Still, more research is needed to discover how the constituents of dates help prevent these diseases (10).